August 27, 2015 – The A.I.N.P. 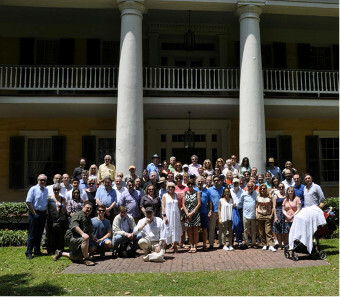 (International Association of Professional Numismatists, IAPN) has held its annual meeting from the 28th May to the 1st June 2015 in New Orleans (Louisiana State, United States). 43 companies were present (plus 30 represented by) out of the 102 companies of the Association, coming from 20 different countries. After the first congress AINP – IAPN in 1951, these important numismatic companies gather in a different city of the world for the annual congress. This non-profit association was formed after the Second World War to improve the relations between professional numismatists: the goals of the AINP are the development of the numismatic trade based on the best practices, encouragement of scientific research and the creation of long-standing relations between the professionals of the numismatic world. The city of New Orleans, which has been French until its sale by the First Consul Bonaparte to the United States of America in 1803, has a numismatic history as well, since a federal mint has minted coins (with the letter “o” as a symbol ) from 1838 to 1909. Numismatic trade started quite soon with the first shop selling coin to the US, which still exists today; some members of the Cohen family, descendants from the founders, also attended the Congress’ opening ceremony, hosted by Mike Dunigan, from Forth Worth (Texas). The professionals of the present 43 brands and their families. The role of the Executive Committee is very important: it generally gathers 3 times a year on the occasion of the most important international coin fairs of the numismatic world (London, New York, Munich, Zurich, … ), it guides the actions of the Association through the work of the different committees, and prepares the Annual General Meeting that usually takes place in May-June. A new member from Thailand has been unanimously elected: Vitoon EURTIVONG (Eur – Seree Collecting Co. Ltd., Bangkok). The traditional Literary Prize (since 1982) was awarded to the book of Silvana and Carlo Crippa: “Coins of Milan” (Volume 4) by Crippa Numismatics SAS in Milan. The gala evening allowed to collect 2845,35 USD for the association “Feeding America” of the Archdiocese of New Orleans. The next congress will take place in Amsterdam (Netherlands) from 5th to 8th May 2016. For more information about the AINP – IAPN, the list of members and the calendar of auctions organized, please visit the website of the association.